My first time at Living Crafts last Friday, the largest craft fair in Europe apparently, “promoting the very best of British Crafts”… The weather was fabulous, and I was lucky enough to be selected to have a spot in the Herts Visual Arts tent, where six of us helped to promote Herts Open Studios, and the HVA as a whole, whilst demonstrating our own crafts. I arrived, with a car FULL of stuff, you’re never sure how much to take, should I take this…. that…. the kitchen sink….?! 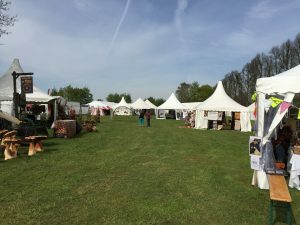 Every time you do another of these fairs, you refine your display techniques, pick up ideas from others on what works well, and what doesn’t…. One thing to be sure is every event throws up a different scenario for you, and no event set up is ever the same. We received the exhibition instructions from our HVA nominee, and I noted I would have a six foot table to work and display on. I estimated how much equipment I could display, whilst demonstrating my wax art within that six foot space…. I mocked up how it would look at the studio, and was pretty happy with my arrangement… Packed up on the assumption that I’d find a spot for the rest of my clobber ‘somewhere’ I’ve always been brought up on the belief that it’s better to have too much, than not enough! On arrival, my six foot table was much narrower than I had anticipated, so there went my first set of plans out of the window! Anyhow, always ready to improvise, we pulled it together, everyone helping each other out, and got a pretty impressive looking tent together between the six of us… We had two different styles of glass makers, a fine artist, acrylic abstract artist, multimedia artist and moi with my wax painting representing Hertfordshire artists that day! 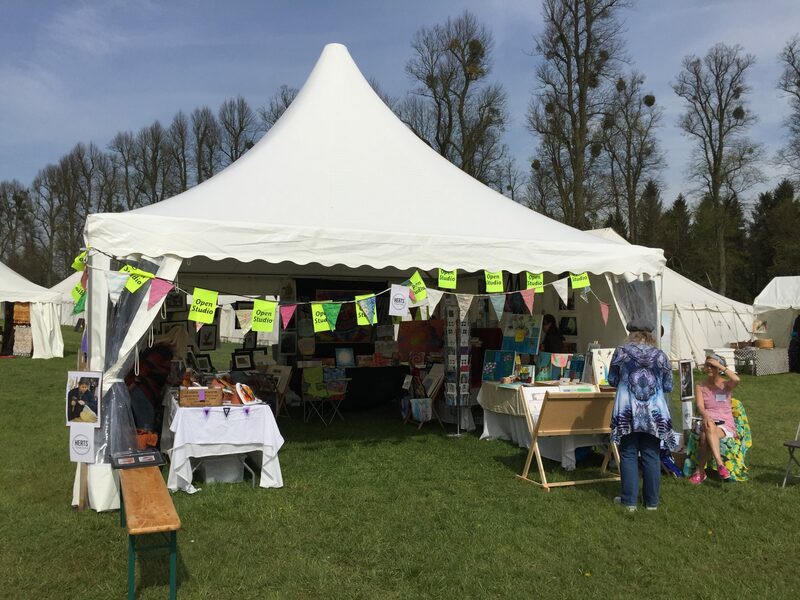 Living Crafts 2016, Herts Visual Arts Tent. You’re never quite ready when that first person walks through the door, and last Friday was no exception… I went to plug my iron into the power supply, only to find, my UK plug would not fit into the round socket I had arranged my entire display around… Sh!!t…. Was my first impression… this could be a disaster!!!!! Luckily, a very understanding lady said it wasn’t a problem, whilst I scuttled off to find a Living Crafts representative a bit sharpish…! I found a lady with a bright yellow tee shirt almost instantly, who said she’d find the electrician, and send him to sort it out…. Feeling nervous, I went back to my tent… What a start….!! Happily, most other people were oblivious to my little hiccup, and having just started on a well needed coffee, the electrician turned up, smiling with the correct extension cable in his hand… cracking jokes, and being generally cool… Thanks Living Crafts, ten out of ten on problem resolving front! Demonstrating, after they sorted a power supply! Right then, on with the task of showing people what these small blocks of wax, and an iron do….! The morning brought a steady trickle of people around, many of whom were suitably impressed with their demos, and interested in finding out more, promises of visiting on my studio open days, or interested in workshops, or prosecco nights… The afternoon was much busier, and I regularly had a group of people around the already cramped table, feeling a bit like a pint in a half pint pot at times…! It was a great experience to share this medium with other like minded crafters, it is such an unusual, tactile medium, and visually captivating, many were instantly hooked into finding out more. Would I do it again…? I would love to do it again! Ideally, if you could do two days back to back, it would help to make it less onerous, there is so much packing up and unpacking for one day, but I understand that it must be fair to the other HVA members who might like to demonstrate there too. 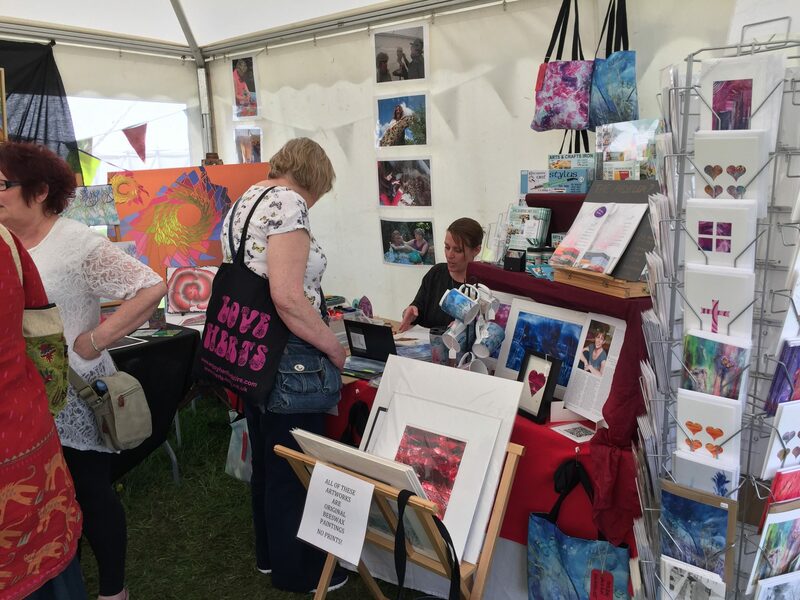 My observations were that there were more sales of bags, mugs, and equipment, (which I had), rather than the actual artwork… In fact, I didn’t sell any artwork at all. However, I suspect much of the audience there are already crafty, and more interested in finding ideas and inspiration, rather than there to buy art, but I may be wrong. 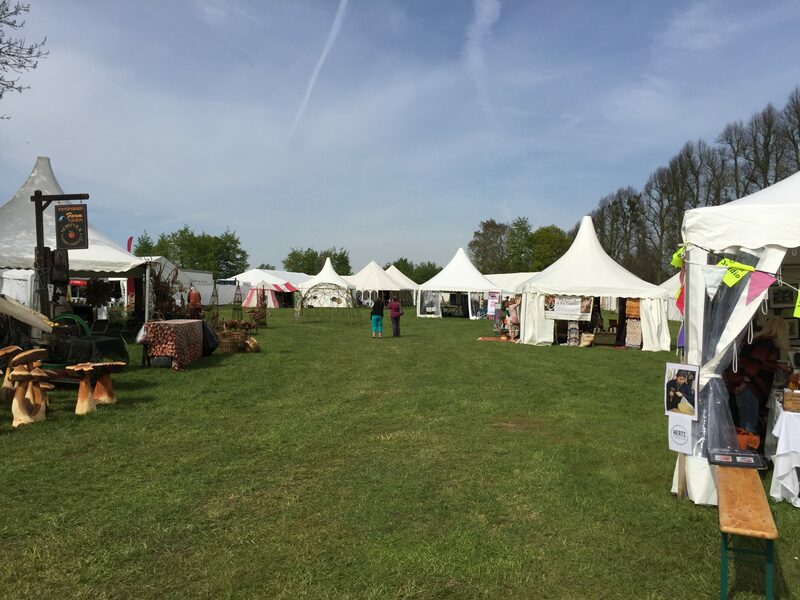 I didn’t get the chance to go around the whole fair, I was too busy, but would love to hear how you got on if you were exhibiting there…. 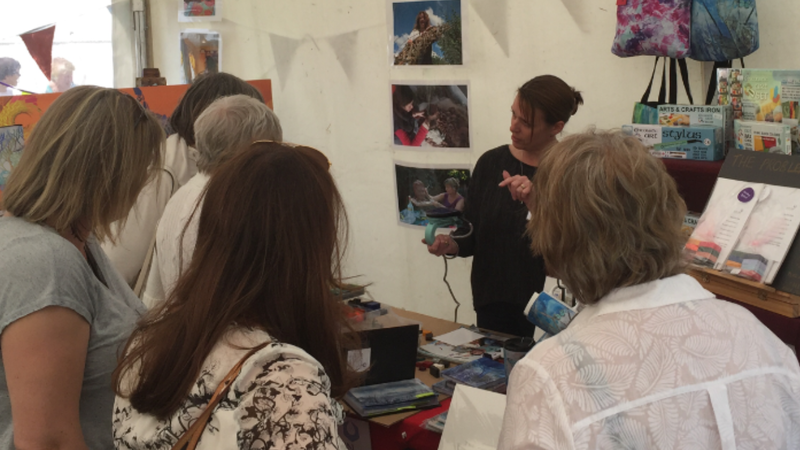 Big thanks go to Herts Visual Arts for allowing us to demonstrate at such a great event, and providing us with the opportunity to be there. I doubt I would have instigated that on my own directly at this current stage, so it’s a great stepping stone to potentially renting a booth, and exhibiting for the full four days another year. If you are interested in having a go at wax art yourself, you can check out my blog post, making getting started with wax more affordable here. 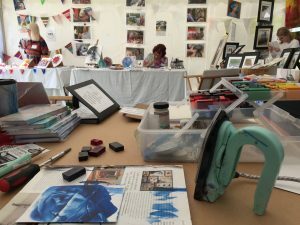 Come to my studio open day on Saturday 14th May 10am – 3pm, The Stables Studios, Studio 4, Pouchen End Lane, Bourne End, Hemel Hempstead, Hertfordshire, HP1 2RJ. You can see more examples of my work on Artfinder, but hope you can make it to the studio, the true vibrancy of the colours are so hard to get across via an electronic screen. 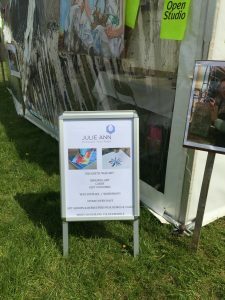 Any questions or queries, contact me by e-mail: julie@julieannsgallery.co.uk, or phone 07976 700737.